I have a special treat for you today! I mentioned several months ago that my mom and step-dad made the move across the country and were in the process of building a home. I'm excited to say that they are closing on their beautiful house this week (which I'll share later). 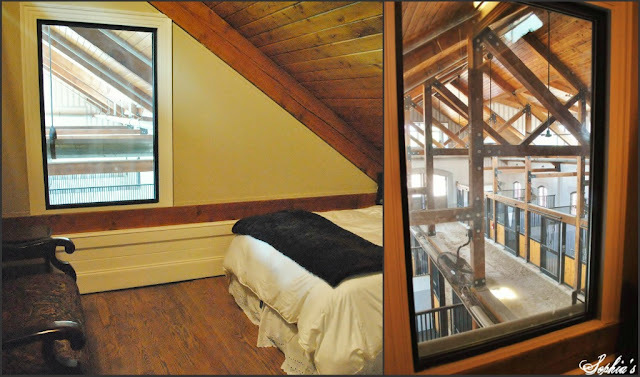 In the meantime, I had the opportunity to take some pictures of the beautiful equestrian barn and apartment in their new subdivision. This only shows about half the barn from the outside...it is huge! Don't you love those lights? This is just one side of the barn...note the balcony for later. 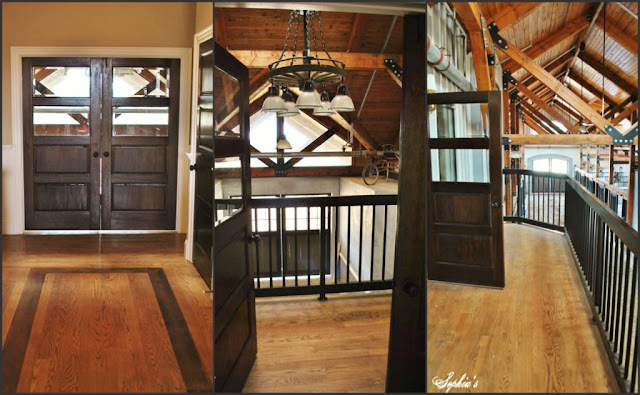 From the wood ceiling and beams to the walls of windows streaming in sunlight, it's a gorgeous space that you'd never expect in an equestrian barn! All along the opening to the stairwell and along the way to the bedrooms is a huge granite counter with wine fridge...perfect for entertaining! There is nothing else like this in the world, I'll wager! Thank you for taking the gorgeous photos and sharing with us on SSS. Wow, this is amazing!! Absolutely stunning. What a unique apartment! Thanks for sharing it with us. Thank you so much for sharing these beautiful pictures. I venture to guess we will see many of these on Pinterest! Well done! Wow this is stunning! I love all the dark wood beams, this looks like no barn I have ever been in! Thanks for sharing these gorgeous pictures! It's just amazing! I would love to live in a place with so much attention to detail. What an amazing space! Who wouldn't want to spend some time there? Thanks for sharing. beautiful! What a perfect way to wake up in the morning-just look down and see how the horses are. Wow! Wow Kristen...that barn is gorgeous...the ceilings are magnificent!....I am so happy that your mom and dad are finally closing on their home..I know how excited they were in the building process...I can't wait to be able to see ... just know it is going to be beautiful!! Thanks for the fabulous tour!! !...Such a gorgeous area! Woa! Amazingly beautiful...every square inch was thought out to perfection. Where may I ask is this beauty of a barn? Wow - what a stunning space! Thanks for sharing it with all of us. Looking forward to seeing your mom's new place. I'm sure all of you are very excited!